GameOn Monthly Three Strikes – Now FREE Entry for New Players! Want to give competitive pinball a try? Check out one of our monthly three strikes tournaments — entry is now FREE for new players! All skill levels welcome! Cost: In addition to the cost to play the games for the night (usually $1/game), tournament entry is $10 for players in the top 5,000 in the IFPA standings or $5 for all other players. NEW: No entry fee for new players! Starts at 7 p.m. and should be done no later than 10 p.m. (that’s for the final players remaining). Format will be a 3 strikes tournament. Groups of 4 will be assigned a random game each round, with the players finishing in 3rd and 4th place each receiving a strike. Once a player receives 3 strikes, they are eliminated from the tournament. If there’s less than 14 – 16 players, it’s possible games will be one vs one instead of groups of four. Limited to 32 players. Sign up in person the day of the event. Top 3 players will be paid out if the field is 30 or less players. If it’s 30+ players, top 5 will be paid out. Note: If a player that is ranked between 5,000-99,999 (or unranked) finishes 1st or 2nd, they will receive only 50% or 30%, depending on finish. They will not receive the 20% as well. The 20% prize will go to the next highest finisher in that ranking bracket that’s not in 1st or 2nd overall. Note: If a player that is ranked between 5,000-99,999 (or unranked) finishes 1st, 2nd or 3rd, they will receive only 40%. 30% or 20%, depending on finish. They will not receive the 10% as well. The 10% prize will go to the next highest finisher in that ranking bracket that’s not in 1st, 2nd or 3rd overall. This payoff structure is to encourage newer players and guarantee that at least one new player will be “in the money”. This entry was posted in Tournaments on May 8, 2018 by k3v2. Team pinball, charity, and beer. Need I say more? My attorney would say yes, yes I do. Here’s the scoop: You and a partner form a team. That team will battle other teams (12 total), in a winner take all split flipper battle royale. Format will be five strikes and we’ll play in groups of four teams per machine. When: Sat. April 28, 2 p.m.
Register: The cost is $20 per team. To register, please send that via PayPal to: buffalopinball@gmail.com Make sure to include your team name and team members. If it’s not sent via “family and friends”, it will be returned and you won’t be registered until you do so. Games will be on coin-drop per usual. This is limited to only 12 teams, so sign up before it sells out. Prizes! 50 percent of the registration will go to Path of Play, while the other 50 percent will be paid out to the winning team. 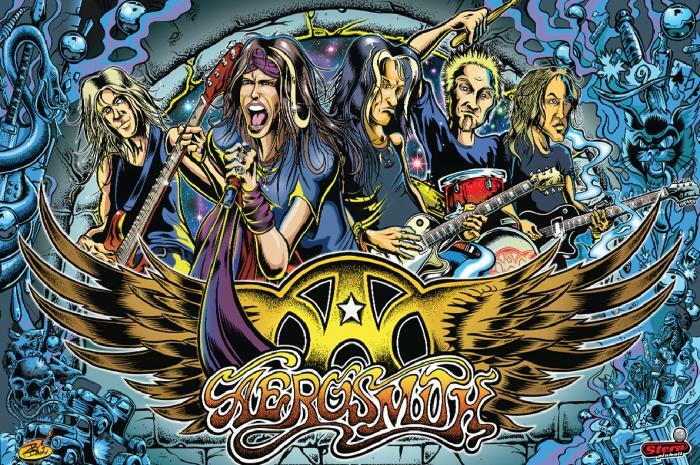 In addition, every registered player will have a chance to win an Aerosmith pinball translite (it’s the awesome Dirty Donny back box artwork panel from a real pinball machine) from Stern Pinball, as well as Buffalo Pinball stickers and lapel pins! One free sticker with every paid entry! This entry was posted in Tournaments and tagged buffalo, charity, pinball, tournament, Tournaments on April 9, 2018 by k3v2. We’re stoked to partner up with Community Beer Works for the return of the Pinball Weekend to benefit Boys and Girls Clubs of the Northtowns! All the info is over on the CBW Facebook Event listing, but here’s a rundown. Stop down and join us for a fun event to benefit a great cause! We have a thing for beer. We have a thing for pinball. We have a thing for being charitable. We have a thing for doing something more than once. 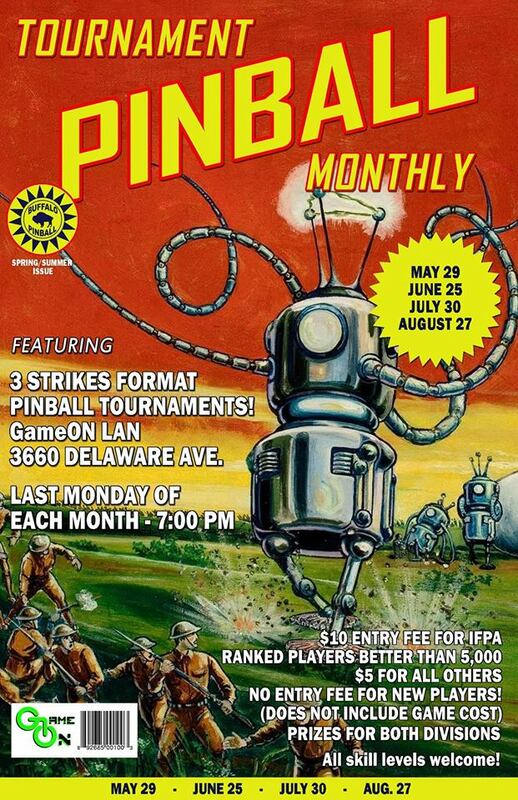 We’re brining back CBW Pinball Weekend for a second year! All weekend we’ll have several machines here for your pinball enjoyment, courtesy of Buffalo Pinball & Arcade Company. On Friday 3/9, we’re brining back Rage Tilt APA, an easy drinking 5.5% ABV American pale ale made with Amarillo, Galaxy, and Azacca hops with lots of tropical fruits and citrus meant for knockin’ the chrome balls around. Half of all the coins pumped into our pinball games will be donated to The Boys and Girls Clubs of the Northtowns. Additionally, $1 of each pint you purchase over the weekend will go toward the charity (so drink up). On Saturday 3/10, Buffalo Pinball will hold 30 minute training sessions from 2-6pm to help you get ready for the tournament. Sessions are included with a $5 donation to the Boys & Girls Clubs of the Northtowns. Each 30-minute session will include three people. Simply come to the brewery if you don’t mind having a pint while you wait for the next open session, or message us here if you’d like to sign up for a specific session ahead of time. On Sunday 3/11 we’ll have our Second Annual Charity Pinball Tournament. Qualifying rounds will be held from 11am-4pm. A $1 donation to the Boys & Girls Clubs of the Northtowns gets you one registration into the tournament—you can try more than once! For each attempt, you’ll receive a raffle ticket to win prizes. There will be three machines to qualify on. You need to play each machine at least once, but can keep playing them to try to improve your score. Playoffs start promptly at 4pm for the top six qualifiers, with the top two getting byes straight to the finals. Playoffs will be two rounds, one game each round. We’ll post here about the specific games and prizes, as well as other goodies being featured that weekend (like tasty new beer releases). Until then, practice up on your pinball skills and get ready to join us every day for Pinball Weekend 2 at CBW! This entry was posted in Tournaments and tagged charity, pinball, tournament on February 28, 2018 by k3v2. 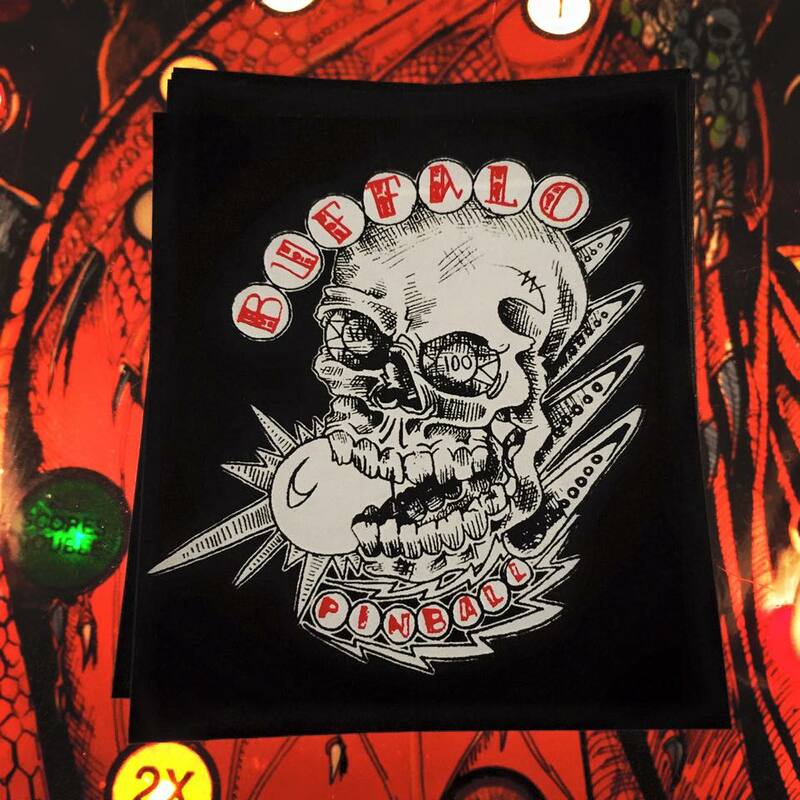 At the Buffalo Pinball Summer Open ’18, players will compete for cash prizes, trophies, World Pinball Player Ranking points and qualification toward the Stern Pro Circuit Final in this IFPA-endorsed event. The event will consist of four tournaments: A single, main tournament (qualifying Friday and Saturday, finals Sunday), two classics tournaments (one Friday, one Saturday), and a women’s tournament (Sunday). The tournaments are open to players of all skill levels, and there is no limit to the number of players for the main or classics tournaments. On the shore of the Niagara River, the Sandy Beach Yacht Club will provide a one-of-a-kind setting for this year’s tournament — just five miles from the brink of Niagara Falls. This entry was posted in Tournaments and tagged buffalo pinball, buffalo pinball summer open, PAPA Circuit, stern pro circuit, summer open, tournament on January 15, 2018 by k3v2. All are welcome! 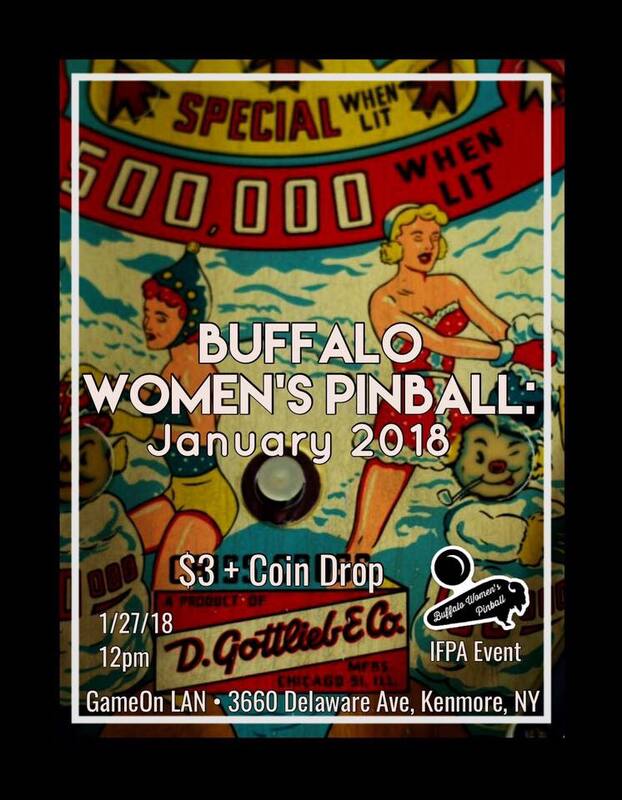 Join us on 1/27/18 for our monthly IFPA Buffalo Women’s Pinball event. 2 hours of Match Play- Groups of 4 (3 when necessary). Game play starts at 12pm, playoffs start at 2:15pm. New to 2018: $1 paid to IFPA per player. The remaining money will go to prizes. 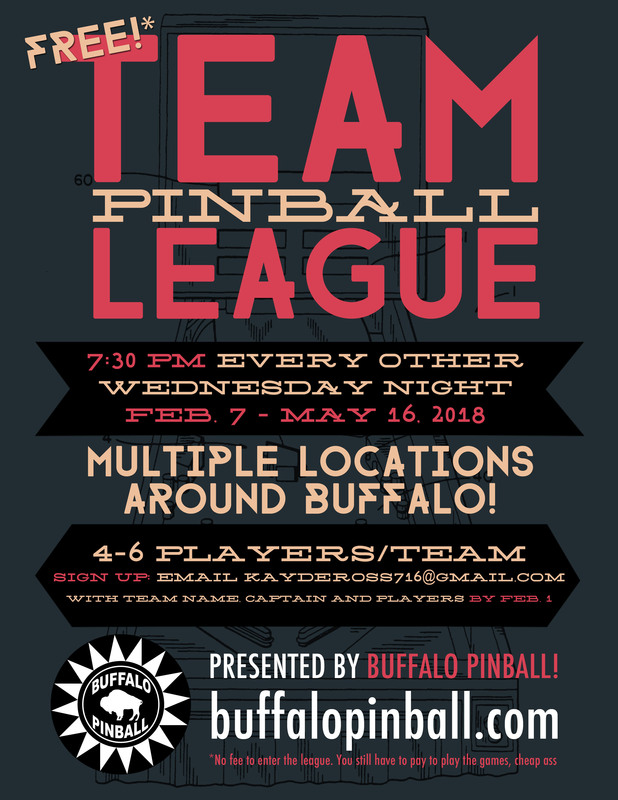 This entry was posted in Buffalo Women's Pinball, Tournaments and tagged buffalo, buffalo pinball, gameon, pinball, women's pinball on January 2, 2018 by k3v2. December 30…the day before New Year’s Eve…in the afternoon….what else are you going to do? 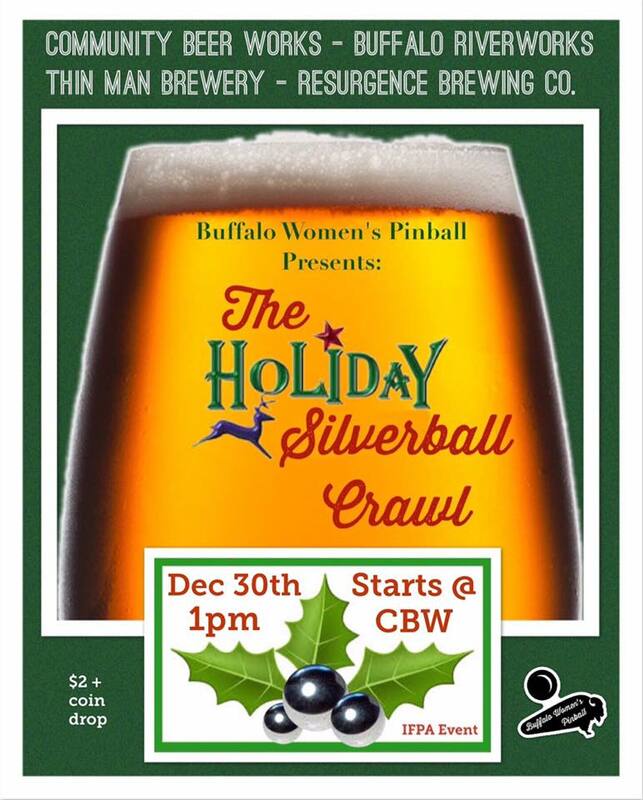 Join other women in a multi-brewery pinball tournament – it’s just $2 to enter plus coin drop. The event will start/end adjacent from each other to promote carpooling and safe driving. We will play 9 machines: your best 7 of 9 games will count. No playoffs. Tie breaker if necessary. Less than 15 players: Winner takes all! This event is IFPA endorsed and the results will apply to your IFPA Women’s World Pinball Ranking. 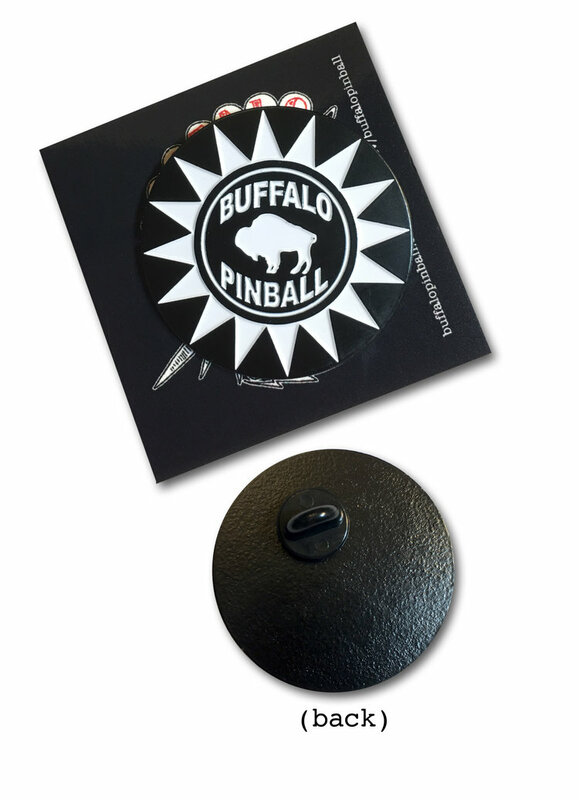 This entry was posted in Buffalo Women's Pinball, Tournaments and tagged pinball, tournament, Tournaments, women's pinball on December 18, 2017 by k3v2.